This item no longer seems to work. It did not appear to affect the skill mod in the brewing menu. It's possible that it just doesn't stack with the Brewer's trophy, but it didn't seem to have any effect without it either. I can't really confirm this though since I'm not sure exactly how it's supposed to work. I thought it would work similarly to the brewing trophy but it does not appear so. This item no longer seems to work. It did not appear to affect the skill mod in the brewing menu. 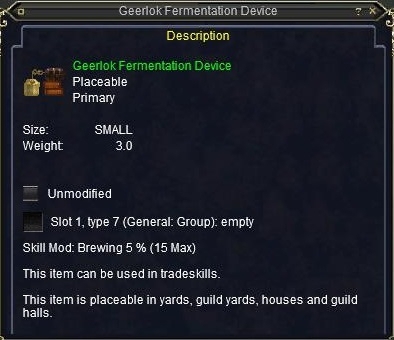 It works fine for me, I have 300 base skill and 315 modified skill when equiping the Geerlok Fermentation Device in my Primary slot. Also I can confirm that it does not stack with the Brewmaster's Mug (+15%). Of all the geerloks, this one has the most common Luclin drop (porous block off of netherbians in Netherbian Lair), so many tinkers make a ton of these to gain skill in tinkering. As such, the market is flooded with them, and they go for an average of 50pp on the Sol Ro server. The tailoring and jewelcrafting ones still hover around 500, but this one is always pretty cheap, as the supply far exceeds the demand. I actually got mine for 15, but 50's about average for this one. Either way, I'd definitely want one if I was trying to brew champagne or make my tradeskill trophy. If I was just brewing for skill, I wouldn't bother though. Either way, will probably try to buy one of these soon! Basically this (as well as the other geerloks) effectively raises your skill by 5% for the purposes of determining chance of success. The highest you can modify your skill to is 255. In your skills list, it will still show your unmodified skill. So for example, you had 100 brewing and equipped this... your skills list would still show your brewing as being 100, but when you attmepted to make minotaur's hero brew, you'd have the same chance of suceeding as if you had 105 brewing. finally, something worthwhile to tinker!